A few weeks ago when I visited the Ideal Home Show we took a tour around the Green Eco Showhome. Afterwards we chatted to a lovely man who told us lots about the Green Deal scheme which aggregates businesses and home owners to create greener buildings. It’s a Government initiative which hopes to encourage more of us to employ a green or eco-friendly attitude when we develop our homes. It has had me thinking more and more about what we can do to make our home more energy efficient. We have a very old house, over 100 years old and I thought we weren’t able to have cavity wall insulation for example as the walls have no cavity. Apparently, the man from the Green Deal told me there’s an alternative on which he’s sending me some more information. I’ll look forward to receiving it. So what are the main things we can do to help our homes become greener? This is an obvious one, and I know it’s mentioned a lot but it’s worth looking at as it will save you loads on your heating bills. When it snows have you ever played the game of looking from your bedroom window to see which roof melts the snow the fastest. They’re the ones that need new loft insulation. It can be a messy job, but one you can do yourself and there are lots of websites out there giving you great advice on what to buy and how to do it. This is one we did last year when our 25 year old boiler stopped working. And we have seen first hand the savings you can make on your bills, as well as the difference we are now making to the environment. This definitely isn’t the cheap option but there are grants for some people so that’s well worth looking into. You may think that there can’t be many people that don’t have double glazed windows these days, but you’d be wrong. In our area, there are many period properties that still have their original sash windows. They look beautiful and fit well with the property, but at times it can feel like a gale is blowing through your home! Fitting double glazed windows, or even secondary glazing doesn’t have to mean sacrificing on style or ruining the look of your period property. Many companies have broad ranges so take a look around. Somewhere like Safestyle Windows, for example even fit energy saving glass that retains more of the sun’s heat. Again, this development can mean a relatively big outlay but there are grants available. The Green Deal can help with this too, and there are lots of different ways to generate your solar power so well worth researching. Generate your own power and sell the excess back to the grid, making you money and offsetting the outlay. Brilliant. As I mentioned earlier there’s cavity and solid wall insulation, draught proofing, hot water cylinder insulation and insulation of your pipes and ducts. Oh and don’t forget to insulate underneath your floors too. There are so many ways to make your home energy efficient. It won’t mean affecting style or look of your home, and anyway if it does, does it really matter. This is one area where we should be ok to sacrifice a little style if we need to. What do you think? How energy efficient is your home? 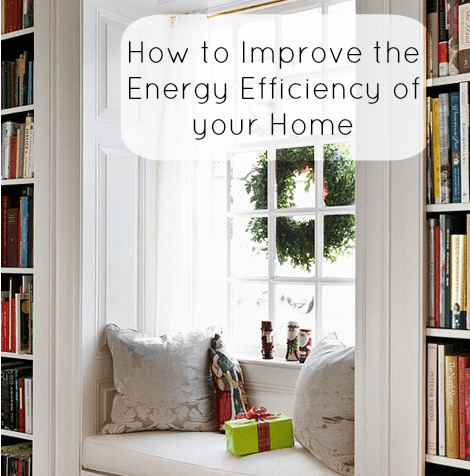 Improving ones homes energy efficiency rating should always be encouraged, as not only will it directly effect your contribution to making the world a more sustainable place. But also by installing efficient boilers, perhaps even a biomass boiler, then you will experience the lowering of energy bills, which is always a good thing. Hi Jen, the ECO grants for free boilers are available for households who have an annual income of £15,860 and receive working tax credit or benefits. Solar power is a great suggestion which too many people overlook due to the initial outlay. Green deal effectively removes the outlay because you pay the installation costs from the savings you make on your energy bills. You can actually make a profit of around £7700 over twenty year period with solar panels, because you can sell any excess energy you generate back to the grid. Also if you move house, and your green deal loan has an outstanding balance, the new owners become liable since they benefit from the improvements! I completely agree with the points you make, particularly on double glazing. It’s crazy how many properties have doors and windows that let out so much heat and let the cold in! Personally I don’t understand why there isn’t a government subsidy for energy efficient windows like what is offered with insulation. I live on the coast in North Wales in a period Victorian property and my house was really cold due to the rather large sliding sash windows, I am not in a conservation area and could have replaced them with modern windows but the reason we bought a period property was for period features. I did some research and found you could have your period sash windows draught proofed and also double glazed , and that is what we did and the results were amazing , I am so happy I stuck with my gut instinct and did some research on the subject. There are quite a few companies that carry out the work they all seem to be pricing along the same lines, in the end we plumped for this local company and are very happy with our end result.